The party disembarked from the train to find the station in total chaos. Outside was no better, the square in front was a seething mass of bodies and noise. Once on the road they were struck by a stark contrast, the once bustling city was silent, there were no vehicles, no people. The city was dead, just an eerie silence as they were driven to their accommodation, officers in the stiflingly hot Minto Mansions hotel, ratings in the Mayo Masin Club. They had endured fifty one grueling days on the road since escaping from Hong Kong. Lt Kennedy RNVR "We were met by a British Army Officer, Captain Cowie, from Glasgow. We found the station square outside packed with Indians clamouring to leave, and we were greeted with the astonishing news that Singapore had fallen. Eve Curie, Author & Journo “The station was one large bottleneck - and, as I was quickly to find out, the liveliest spot in town. Indian, Burmese, and Chinese refugees, crowds of them, were lying on the platform or sitting wearily on their bulky, shabby bundles, like flocks of frightened animals. Fifty six year old Rear Admiral Cosmo M Graham had just hoisted his pennant at the Navy HQ after flying in from the Persian Gulf to take over as Commodore Burma Coast Command. Gandy gave a brief account of his escape from Hong Kong, before placing the Ship’s Company of the late 2nd MTB Flotilla at the Commodore’s disposal. His orders were to rest the ships company for the day and report back the following day. Eve Curie, Author & Journo "I managed to get a glimpse of the city while driving in it at full speed from one place to another. 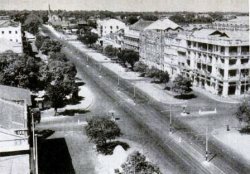 The residential and commercial sections of Rangoon were practically untouched. The Japanese had been hammering chiefly at the Mingalodon air base and had bombed the town just enough to spread panic among the native population. Lt Kennedy RNVR "As police control had collapsed and the jail doors and asylum gates were open, it was not healthy to go about unarmed and we set off in search of an evening meal, a villainous, bearded band with heavy .45 revolvers strapped to our sides. Gandy along with his senior officers reported back to Navy HQ for orders. Lt's Collingwood & Kennedy were retained for staff duties. A/B Barker was enlisted as the Commodore's driver. Lt Ashby was retained as SNO port duty, while Gandy was assigned to complete a feasibility study on a special mission to Bassein, now Pathein ninety five miles west of Rangoon. Ships Log "At Rangoon. Officers in the Minto Mansions [hotel] ratings at Mayo Masin Club, later transferred to Burma Navy depot. Lt Kennedy RNVR “The Minto Mansions struggled to keep going during the next week, and Mlle Eve Curie who had just come out from reporting in Russia stayed for a few days before going on into China. George Rodger, Photo Journalist "The criminal and crazy ranged the city, looting whatever they could carry and burning what they could not. Gandy, a former land surveyoy in Hong Kong proceed to the river-port of Bassein. His brief was to assess the feasibility of the port for use and subsequent defence. The IJA bombed the runway while he was inspecting the airfield with officers and officials of the Bassein Defence Advisory Committee. The party were in Rangoon for five weeks loading merchant ships, while some of the flotilla were deployed to man motor launches due to Burmese desertions, as well as doing special duties, which included stopping looters. In January 1942 men of the Royal Marine Coastal Regiment in Ceylon volunteered for a mission of a hazardous nature known as Force Viper. Five officers and 102 NCO's and Marines arrived in Rangoon under Major D Johnson RM to protect the docks and oil refineries. V-Force took over motor launch patrols using a variety of speed-boats and four requisitioned tourist launches to protect the outer flanks from Japanese insurgents infiltrating the inland waterways. Certain members of the escape party, including Lt Ashby, Sub-Lt Brewer and Petty Officer Buddy Hide volunteered to assist the Royal Marine Commando. David MacDougall MoI "I refused good offers to stay in China, and in Calcutta because I wanted to see how the land lay at home. But I want my freedom of action just for the moment. The Ambassador is being transferred to Moscow, but he is very anxious for me to stay on in Chungking on my own terms. Lt Kennedy RNVR "The order came through from GHQ to stand by for final evacuation. At the naval offices files and papers were being burnt. The Commodore transferred his flag to the 'SS Heinrich Jessen' from the shore based HQ. The Jessen was now let to the "China Navigation Company" for war duty from Butterfield & Swire, Hong Kong, George Rhod Hansen, the Master received an extra GBP 5.00 war risk bonus. The officers and ratings of the Hong Kong escape party were ordered to repair on board the Heinrich Jessen. As well as her standard ante-aircraft armament, extra Bren and Lewis machine-guns were mounted and trained on the wharf due to the looting taking place amidst theincreasing chaos. "The docks were in a state which it was hardly believable could have existed in any British possession. "All seaworthy motor-launches and local naval defence vessels were ordered to proceed to Akyab for the protection of that port and its airfield from sea borne attack. Ships Log "One CPO, one SPO, and one L/Seaman left for Calcutta assisting with mine-sweepers in tow. Ten ratings drafted for duties in ML's. Ten of the MTB ratings were drafted to assist the Burma RNVR who, with both British and Burmese officers, had just five ML's and a few auxiliary vessels left. Most of the Burmese officers and ratings had deserted. 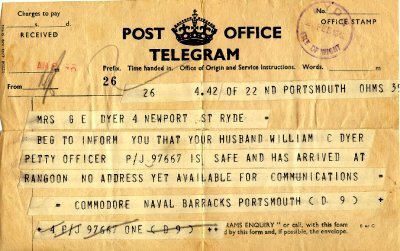 Lt Kennedy RNVR "Along with two old ship-mates, Petty Officer Dyer and Able-seaman Downey, I was sent to join His Majesty's Burmese minesweeper 'Somagyi', and we drove to the docks in a jeep piled high with gear, Rangoon looked even more desolate than ever. We were witnessing the complete disintegration of civil order, and it was a sad and ugly site. HMBS Somagyi was one of three Port of Rangoon tugs and buoy vessels converted for mine sweeping duties when the Burma RNVR was mobilised in June 1940. Lt Kennedy RNVR "In the late afternoon we sailed from Rangoon in company with the ML's and other small vessels. Once out of the river the 'Somagyi' started to roll, and what a roll, a roll which persisted even in the slightest sea, and being coal-fired our speed was dependent almost entirely on how sea-sick the Burmese stokers were feeling. Gandy concluded that Bassein could not be defended with the limited resources available. With the airfield now out of commission, he had no alternative but to send a signal requesting a sea passage back to Rangoon, a river and sea journey of two hundred and forty five nautical miles. George Rodger, Photo Journalist As night fell, the sky lit up with fires. The lunatic Burmese, led by the convicts, were setting fire to houses of the well-to-do and the Hindu labourers who did the work of Rangoon. Nobody was caught. British officers shot a few of the Burmese but there was nobody to remove the bodies, because under the Buddhism of Burma, burial is a privilege reserved to certain religious groups. The smell of death and charred wood weighted the air of Rangoon. Ships Log "Received orders to load other ships of convoy which then proceeded. Worked all night placing depth charges under cranes on wharf ready for demolition. Rangoon almost completely deserted. Fires being lighted by the Burmese all over the city during the night. Burmese cutting up Indians on every opportunity. Lt Kennedy RNVR "The Burmese had no love for the Indians who had a big share of the business interests in the capital. Now, when law and order was crumbling, was their opportunity to retaliate. Alec Damsgaard, who had been shot in the leg and abandoned on board the Cornflower launch in Aberdeen Channel arrived in Shanghai in the early hours after being released from hospital in Hong Kong. He had left Hong Kong by steamer with Herr Heisterberg, a fellow Dane, for the three day passage. During the month of March The heat increases rapidly by the day. Ships Log "Orders received to sail - destroyed all gangways on wharf. Sailed for Akyab. Anchored at mouth of river. No air raid - demolition set. David MacDougall MoI "I may be here (Lagos) for a week more but my bags are kept packed for instant departure whenever the chance occurs. They only give you about an hour’s notice. I left Chungking on the 20th Feb. and arrived here yesterday, having come more than half way round the world. Exhausting but interesting. My wound is almost healed and is going on nicely. I refused good offers to stay in China, and in Calcutta because I wanted to see how the land lay at home. Ships Log "Loading fuel oil into Jessen and working unloading 2nd convoy. Ships Log "All day work on convoys. Jap's over and near Rangoon. Position again very serious.